I love ABC’s Speechless. It is one of my favorite shows currently on the air. As someone with cerebral palsy, I’m beyond thrilled that someone like me is finally being shown on TV as just a regular character, not a “special” guest to teach the non-disabled characters the meaning of kindness. Micah Fowler, who plays JJ, actually has cerebral palsy, a fact that excites me to no end. Unfortunately,the show has a worrying trend of sort of sideways swiping a trope or stereotype about disability, but not directly subverting it. It’s like after the first few episodes, the show lost its nerve. And nowhere was that more obvious than the latest episode, O-S-Oscar P-A-Party. This was the point where I thought they were going to make fun of the sweatpants stereotype and point out that a person’s level of organization actually has to do with their personality, not whether they’re raising a kid with a disability or not. Instead the show just never quite went there. In the end, the moms realize they all have more in common than not, and the show ends with them sitting around a table, talking about how moms who don’t have kids with disabilities just “don’t get it all, trotting out another overused stereotype that the lives of parents who have disabled kids are so different than the lives of those without disabled kids that they might as well be on different planets” I was severely disappointed. Why is the sweatpants stereotype dangerous? It promotes an image of parents, particularly mothers, who have kids with disabilities as some sort of martyrs. The implication is that raising a child with a disability is just so hard and exhausting that it leads parents to become wrecks. This stereotype leads to sympathy forparents who murder their disabled children. In this view, parenting a disabled child is so difficult that it’s only natural for parents to snap under the strain. Some parents, in the age of blogging, have even gained a sort of fame by leveraging this stereotype. Lexi Magnusson, a mother of an autistic child and another with Down Syndrome, has styled herself as “Lexi Sweatpants” and went viral several years ago with a spoken word piece about how jealous she is of parents of non-disabled kidsThe sweatpants stereotype evokes pity and a deep-seated relief for parents of non-disabled children – a relief that says “Thank God my kids are normal. Thank God I’m not like her. I couldn’t handle it.” As a former disabled kid who grew into a disabled adult, I’m standing up (metaphorically due to cerebral palsy) to say that we don’t need pity. Pity kills. I’m disappointed in Speechless. They had a chance to tear down one of the most insidious stereotypes about disability. Instead, they went for the safe, palatable option. I expected better of a show that’s done so much for disability representation. I hope that future episodes, like tonight’s episode, will be different. 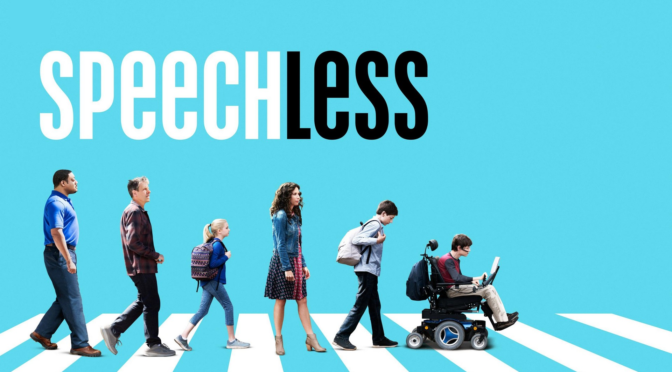 Speechless airs Wednesdays at 8:30 PM ET on ABC. You can watch full episodes, including O-S-Oscar P-A-Party here.